Chapters on insect trace fossils in other substrates are included in the book to provide a very concentrated, but no comprehensive, overview on the whole universe of insect trace fossils, particularly interesting for entomologists. Insect trace fossils are very in common in plant remains. Traces in wood have been described since the second half of the nineteenth century and involve mostly borings of xylophagous groups of insects, such as cerambicids, buprestids, scolytids, carpenter bees and termites. Described ichnogenera, revised herein, include Paleobuprestis, Paleoscolytus, Paleoipidius, Xylokrypta, Anobichnium, Asthenopodichnium, Xylonichnus, Stipitichnus, Cycalichnus, Dekosichnus, Pecinolites and Linckichnus among others. The big picture of insect trace fossils in wood shows a lot of brief descriptions scattered in the literature, a few ichnotaxa described, which in many cases are not compared with each other, and the lack of the standardized set of ichnotaxobases to erect new ichnotaxa. Traces in fossil leaves are more numerous and its ichnotaxonomical scenario very complicated. Mostly, these traces are grouped in functional feeding groups, including excisions (marginal, non-marginal, window and skeletonizations), galls, mines and incisions (piercing and sucking and ovipositions). Extant and fossil examples of these functional groups are briefly revised, mostly dealing with the best defined ichnotaxa representing them. Some of these ichnogenera are: Phagophytichnus, Folifenestra, Paleoovoidus, Paleogallus, and Fenusa among others. 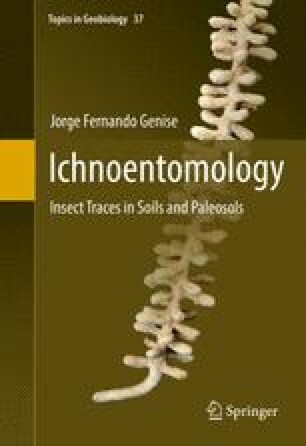 Stems, petioles, seeds, pollen, spores and fruits also show insect trace fossils, which are briefly reviewed in this chapter, including ichnogenera such as Carporichnus, Lamniporichnus, Acrobulbillites, and Petiolocecidium among others. Color plates of extant and fossil traces and their producers are provided.